Pete is a full-time musician based in North London. By the age of 9, Pete was performing with the Peterborough Youth Ensemble and had already started performing at wedding ceremonies professionally. Now providing electric bass and double bass as his first call, the multi-instrumentalist has performed and recorded at prestigious and iconic venues such as The Cadogan Hall, Henry Wood Hall and Ronnie Scott’s Jazz Club with world-class musicians; including the likes of James Woodrow, Audrey Riley and Kenny Martyn. Pete has a natural flair in his performances and is in much demand; you may have caught him at your local arena or festival performing with contemporary musical acts, such as Myleene Klass, La Voix and Katherine Jenkins. 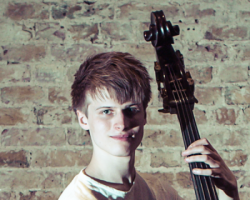 He has also been a resident double bass player at the Grosvenor House Hotel. Pete has been fortunate enough to work with numerous composers, such as Andrew Lloyd Webber for the revival of "The Woman In White". Pete has also worked with the internationally acclaimed composer Gavin Bryars, performing and recording the world premier of his latest cantata "Language is a Virus From Outer Space" at the Queen Elizabeth Hall when he was just 19. Today and tomorrow, alongside ceaseless musical and general exploration, Pete is currently working with Andrew Lloyd Webber performing in "The Woman In White" at the Charing Cross Theatre. In addition to this, Pete composes, works in various show bands, function bands and holds the bass chair for "Feeling Good" - the Michael Bublé show. He also regularly performs with Bye Bye Baby and teaches from his home in North London. I have taught privately for over 6 years. I also have a BMus(hons) in Music Performance and a level 6 teaching licentiate. Learning a musical instrument can be a very personal experience. I recognise that all students have different ambitions and learn in different ways, so it is my job to recognise these and encourage them in order to help my students grow. If I am meeting a new student for the first time, I like to ask them about their interests in both musical and non-musically terms in order to find out what type of learner they are. I can then use this to the students advantage, helping them to achieve their goals in the best way possible. Learning all contemporary genres, technique, improvising, sight reading, songwriting, arranging and composition, applied harmony and theory, Rockschool & ABRSM grades, GCSE & A level guidance, sound advice and general musicianship, or maybe they wanted to learn a new song for fun. I like to structure my lessons in a way that covers at least 2 or 3 of these areas. This way, we can keep improving the students musicianship in a range of areas without the brain getting too tired. It will also help to keep thing's interesting for younger students to help keep them focused. I will also incorporate this in the students homework. For my more advance students, or students that struggle to find time to practice; I like to recommend the Pomodoro technique to help them organise their time more effectively. If a student decides to go down the examination route, I can help guide them through this journey. However, whilst this can be a beneficial route for many, I strongly feel that there is a lot more to music than just passing an exam. I will therefore continue to share my thoughts and advice alongside the examination books. I find that this helps my students to develop an even deeper understanding of the material in a practical use. Similarly, I also believe that learning a new concept in harmony and theory, or a technique such as 'slap bass' is irrelevant unless it can be used in a practical manner. I therefore try to incorporate all of my exercises from real pieces of music. This way, something isn't learnt just for an exam -never to be used again.